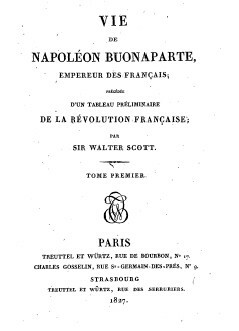 Of all the “historical” biographies of Napoleon, the one most often forgotten but one which played an important part in the creation of the Napoleonic legend was Sir Walter Scott's nine-volume 'Life of Napoleon Buonaparte'. After his success as a writer of fiction (who can forget Ivanhoe or Quentin Durward, not to mention Waverley, Rob Roy and the Bride of Lammermoor, famously made into an opera by Donizetti? ), Scott (1771-1832) was approached in May 1825 by the publisher Archibald Constable to write a book of history. Constable's idea was to publish a series of cheap books for the middle classes, under the title “Constable's Miscellany”, and Scott's (initially four-volume) “Napoleon” was to be one of the first titles. Publication of the work was promised in June of the same year, whetting the reading public's appetite. But in 1826 Constable's business was forced to close and Scott (whose affairs were often linked to those to his publishers) declared bankruptcy as a result. Compounding his (and indeed his wife's) misfortunes, in May of 1826 Scott's wife died. In the period of financial and emotional instability, Scott soldiered on. And though he was assisted in his research, he also undertook some himself, visiting London and Paris in the October of 1826 (the British government gave him special access to papers relating to the St Helena episode). Wellington was said to have provided Scott with a first-hand account of Napoleon's Russian Campaign. Scott then returned to Scotland to compile his notes, completing the nine-volume, supposedly one-million-word opus magnum on 7 June, 1827, with volume one coming out in the same month, published jointly by Cadell in Edinburgh and Longman's in London (the latter had offered 10,500 guineas to publish the work). French interest was naturally immediate, and the Parisian book dealers Treuttel et Wurtz took charge of the publication of the English-language version on the continent and for the French translation, which appeared in the same year as the English-language version. Translations into German and Spanish were soon to follow. The work was to be received coolly on both sides of the channel, for diametrically opposed reasons. Walter Scott proclaimed his own impartiality, but as a result was criticised in Britain by Torys for his positive attitude towards the fallen emperor notably with respect to his military genius, his mastery of administration and his impressive legacy to France (the national system of education, greatly improved communications, and the Code Napoléon). However his negative comments on the emperor his overweaning ambition and his blind egotism) alienated to a certain extent part of his French readership. As for its literary qualities, some criticised his works 'poetry', other his wordy language. Yet others were to note that Scott's knowledge of the subject was extremely superficial. In France, one issue was to cause particular excitation, namely the conflict between Scott and Napoleon's companion in exile, General Gaspard Gourgaud, a disagreement which nearly ended in a duel (Gourgaud was renowned for his fiery temper). The quarrel was caused by the pages in Scott's book which dealt which Gourgaud's departure from Saint Helena. Having had access to British-government papers on the Saint Helena incident, Scott affirmed that Gourgaud on Saint Helena had wanted to return to his family in Europe, that he was tired of his poor relations with Grand-maréchal Bertrand, and that he had informed Hudson Lowe, governor on Saint Helena, and later the British government directly, of projects to rescue Napoleon from the island but of Napoleon's desire to remain prisoner. French journalists took Gourgaud's side, as did Napoleon's other companions in exile, Bertrand et Montholon (Scott had in fact succeeded in uniting them where Napoleon had failed!). The actual duel however did not take place (Gourgaud would have had to got to Scotland) so the conflict became a war of words. 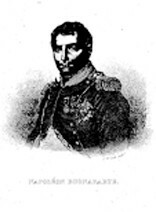 Whilst Gourgaud was successfully represented as a martyr, the doubt had nevertheless been shed, and recent publications on the Saint Helena incident have revealed that Gourgaud was in fact consumed with rancour at Napoleon, Bertrand and the general atmosphere on Saint Helena and did indeed allow himself certain indiscretions and betrayed certain secrets. Another figure unhappy at the treatment of the Saint Helena episode was Hudson Lowe himself. He considered Scott's treatment of him outrageous, particularly the implication that a little more indulgence on Lowe's part might not have gone amiss; indeed it might even have helped. But Scott had taken such great care with the passage where he presents the Napoleon/Lowe differential that Lowe could not take Scott to court. Despite the author's claims to impartiality, modern scholarship still sees Scott's biography portraying Napoleon unrelentingly in an unfavourable light. It has on the other hand remained, because of Scott's fame, as an important stage in the creation of the Napoleonic legend.